The problem is that many people don’t know how to take care of their skin. On the other hand, some think that it’s necessary to use expensive products that are sold on the market. The truth is that you only need to adopt some simple healthy life habits. You can also use some natural ingredients that help reduce these blemishes as well as give benefits to the skin. 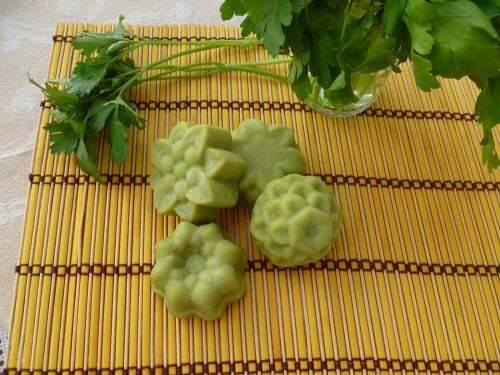 In this article, we want to teach you how to prepare an interesting parsley soap that greatly diminishes these imperfections. 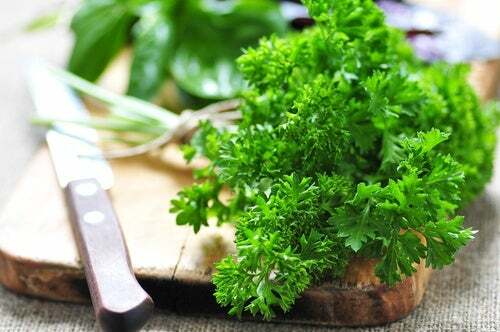 This herb, often used in gastronomy, has been used for cosmetic purposes since ancient times. This is because it deeply cleanses pores, removes dead skin and reduces the appearance of blemishes. It contains powerful antioxidants, vitamins and minerals. After they’re absorbed into the skin, they counteract the negative effects of free radicals and the sun, while improving the process of cell repair. Its contribution of vitamin C helps to maintain collagen and elastin, which is why it diminishes the risk of flaccidity and premature wrinkles. It has a toning and refreshing effect that, in addition to making the skin from, helps control swelling and irritation caused by allergies. This mixture gives us a product with lightening, exfoliating and repairing properties that, when used regularly, improves the appearance of the skin remarkably. Using it several times a week, preferably in the evening, keeps the face free of impurities, while gradually reducing blemishes and imperfections. Use two or three tablespoons of the parsley and green tea plants to prepare each infusion, using half a cup of water for each. Once they ‘re warm or at a suitable temperature, pour in the milk powder, oatmeal and spoonfuls of honey. Mix everything with the help of a wooden utensil and stir until you get a smooth paste. Then, take the glycerin soap and melt it. Then, wait for it to cool down. Put the product in some molds and let it sit for 2 or 3 hours to solidify. Rub the product onto the areas of your face which have blemishes on them and leave it on for 5 minutes. Rinse the product off with cold water and use it at least 4 times a week. Ready to try it?What are you waiting for?! Prepare this simple homemade soap at home and discover a cheap and natural ally to significantly reduce the blemishes that tend to affect the beauty of the skin. The post How to Prepare a Natural Parsley Soap to Reduce Facial Blemishes appeared first on Step To Health. Previous: You Plan on Weight Loss But Just Can't Suppress Appetite, These Food Are Your Way Out. Next: 10 Foods That Guarantee Your Kids a High Fiber Intake!